Sentiments/Non-Humans: Treats all sentient beings with the utmost respect and courtesy until they prove undeserving of it. Has a high regard for life and personal freedom. Sentiments/Coalition: Hates the Coalition, because he has lost numerous friends, family members, and acquaintances to them. Disposition: All around good person. Kind, generous, compassionate and positive. The glass is usually half full. Description: Gangly would be an appropriate word to describe Drake. His tall frame is lean and covered in tightly corded muscle. He has tattoos covering whatever skin isn’t covered in cyber armor. His face shows the story of a hard life with sunken eyes and three days of stubble. His short hair is dark and unruly. Drake wears the clothes and armor of someone who is used to walking the wasteland; it’s covered in rough repairs and dirt. Max. Carrying Weight: 460 lbs. Max. Lifting Weight: 920 lbs. Max. Jumping Ability: 21.5' lengthwise, 8.25' high. Combat Acrobatics: No penalty to strike while moving. Back/Shoulder Blades (2): 18 each. Thighs/Upper Legs (2): 18 each. Basic Combat Awareness: Against One Opponent. • The Cyber-Knight knows what his opponent is doing the same instant his opponent does it, enabling the knight to react a split second faster: +3 on initiative against attacks from modern guns and machines (bionics, robots, etc. ), and +6 against artificial intelligences and computers like Skelebots and automated defense systems. Cyber-Knight is +3 to strike and parry. • Meanwhile, the Cyber-Knight's gun toting or tech-laden opponent is -3 to dodge the Cyber-Knight's attacks and loses 2 melee attacks/actions due to time spent compensating for the Cyber-Knight's amazing agility, combat skills and awareness. Cloud Sensors: The Cyber-Knight cannot be accurately detected with Sensors. • Sensors" are limited to those in Robots, Power Armor, Vehicles with Weapons/Sensor systems. • Inexperienced (1st-3rd Level) sensor operators cannot use sensors at all, and -2 attacks per melee every time they try to figure out what's going on. • Experienced operators are uncertain, hesitate, and lose one melee action, with a -40% skill penalty. Damage: As per Robot P.S. Each power armor description will list the damage under the "Elite" hand to hand stat block. The basic skill, however, only lets the pilot do a restrained and full strength punch and an ordinary kick, no leap kick, stomp or special attacks. and one melee attack/action. Counts as two of the power armor's melee attacks. Last edited by Drake on Fri Oct 21, 2016 8:44 am, edited 23 times in total. Chromium Troop Armor A.k.a. "Little Brother"
*A single asterisk indicates a small and difficult target to strike, requiring the attacker to make a "Called Shot," and even then the assailant is -4 to strike. **Depleting the M.D.C. of the main body will shut the power armor down completely, rendering it useless. Note: Laser weapons do half damage to the Little Brother! Running: 55 mph maximum . The act of running does tire its operator, but only at 30% of the usual fatigue rate . Leaping: Up to 12 feet high or across, double with a running start at speeds of 40 mph or greater. Jet Pack thruster assisted leaps can hurl the power armor 100 feet up or across without actually taking flight. Flying: The power armor comes standard with a detachable, light jet pack. Maximum Speed: 125 mph. Maximum altitude: 1,000 feet. Bonus : +1 to dodge in flight . Underwater Capabilities: Swimming: 15 mph or the jet pack can be used to skim across the surface at speeds up to 90 mph or underwater as speeds u p to 65 mph. Maximum Ocean Depth: 1,000 feet. Class: USA-GA100 Laser Resistant Infantry Assault Exoskeleton. Power System: Nuclear; 15 years of life . The weapon may be built into the right or left forearm. The barrel is retractable when the weapon is not in use or when long range is not required. • Range: Barrel Extended: 2,000 feet. Barrel retracted inside housing: 1,000 feet. • Damage: 3D6 M.D. per blast. • Rate of Fire: Each shot counts as one melee attack. An M.D. blade that extends from a forearm housing as needed. Originally designed by the US Military as a riot control weapon to stun opponents, the Republicans have tweaked it to fire a short-range S.D.C. or M.D. energy blast. To fire, contacts in the spear-like rod draw energy from the suit and fire with a verbal command or the pressing of a concealed trigger stud. The M.D.C. rod can also be used as a blunt weapon or spear. • Damage: Damage for Energy Blasts : Three settings : 5D6 S.D.C., or 1D6x10 S.D.C. or 1D4 M.D. per blast. Damage as Handheld Weapon : Blunt Strike : M.D. as per P.S. Stab : 1D4 M.D.+Robot P.S. damage . • Payload: Effectively Unlimited . Hand to Hand Combat: Power Armor Combat Elite: Glitter Boy. or Power Armor Combat Elite: Little Brother. • +1 extra attack/action per melee round, in addition to those of the pilot, at levels 1 , 3 , 6, 9, 12 and 15. Critical Strike is the same as the pilot's. +1 on initiative, +2 to strike, +3 to parry and dodge, +3 to disarm, +5 to pull punch, +2 to roll with impact. • Punch Damage: 6D6 S.D.C. on a restrained punch, 1D4 M.D. on a full strength punch. • Power Punch: 2D4 M.D., but counts as two melee attacks. • Kick Damage: 1D6 M.D. • Running Leap Kick: 2D6 M.D., but counts as three attacks. • Body Block/Ram: 1D4 M.D. • Full Speed Running Ram: 1D6 M.D., but this attack uses up three melee actions. • Special Sensory Systems of Note: All standard systems for power armor plus the following. 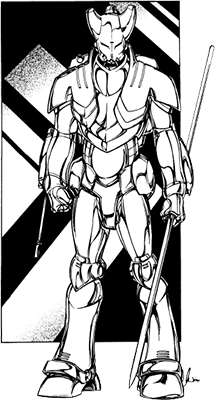 • Laser Resistant Armor: All Chromium Troop Armor are made from special alloys with a chrome-looking surface that is resistant to laser attacks (half damage). 4. Link themselves to their wielder/owner within six months of constant contact. Thus, both man and weapon can sense each other's presence within a four mile radius if separated. 5. Adds +1 to all saving throws. 6. Can be used only by a person of a particular alignment (good, evil, or selfish). Characters of an incompatible alignment take 2D4 points of damage each time they touch the weapon or 3D6 damage if a creature of magic. 8. Can be used only by a person of a particular alignment (good, evil, or selfish). Characters of an incompatible alignment take 2D4 points of damage each time they touch the weapon or 3D6 damage if a creature of magic. • Healing Touch: 2D6 S.D.C. & HP or M.D.C. 6/24 hours. Personality: None, though it does seem to prefer men on holy pilgrimages. History: Forged for a Nepalese warlord in ancient times, who believed fervently that he was doing gods work. The sword bounced around from warlords and soldiers, until it was captured by the Chinese. After some time the Sword made its way to the MET for an exhibit and never left. • Range: Approximately 30 feet. • Damage: 1D6 M.D.C. on Impact, 4D6 M.D. at epicenter, 3D6 M.D. to a 12’ radius. • Note: W.P. Targetting is required, or user can only throw knife 10 feet at -3 penalty. * Indicates a small and difficult target to strike, requiring the attacker to make a "Called Shot" and even then the assailant is -4 to strike. Crew: One pilot and a passenger is possible, but uncomfortable on long trips. Dimensions: 8' long, 850 lbs. 160 mph (256 km) maximum on paved streets, dirt, short grass, gravel roads, and stony deserts. 100 mph (160 km) or less on sand, in tall grass and on rough, broken terrain. Woodland and environments with thick underbrush are likely to be impassable by this bike (and most motorcycles) unless there is a well-traveled path to take; maximum speed is likely to be less than 15 mph (24 km). The Road Hog can ride across sand with fear of clogging its engine. Jumps: The Road Hog is designed specifically for managing rough terrains and making thruster assisted jumps. It can jump 15 feet (4.6 m) high and 50 feet (15.2 m) across with good momentum; increase height and distance of jumps by 50% when the bike is racing at 90 mph (144 km) or faster. And because the wheels and suspension are engineered for leaps and hard landings, there is only a -8% skill penalty to stick even long leaps. Max Range: Electric, 1,450 miles (2,320 km) per charge. Cargo: Limited to saddlebags. Each can hold 10 pounds (4.5 kg) worth of supplies. • Shoulders (2): 45 each. • Arms (2): 50 each. Weight: 80 lbs. +20 lbs from Overcoat. • • Payload: 56 Shots. Recharges 4 shots/hour. Maximum of 336 shots recharged. Worn Battle Jacket Missing Right Sleeve. Last edited by Drake on Tue Feb 07, 2017 8:51 pm, edited 33 times in total. Oliver was born in the 80’s PA calendar. His family was never one to celebrate holidays or birthdays really, they were trying too hard to survive in the magic zone. His childhood, that of which he can remember, was filled with chores and farm tasks. These things though came to an end when a Coalition seek and destroy team came through their little village and rained fire on them. Both of Oliver’s parents were killed in the assault as well as a majority of the other villagers. Oliver hid in a creek bed near his home for three days before finally creeping out due to hunger. It was here that he met Sir Martin, a Cyber-knight who confided in the child that a vision had brought him there. Oliver left the ruins of his village, and traveled with Sir Martin for what seemed like years, even though it was only a few weeks. Sir Martin took the boy to the home of his master a Cyber-Knight known as Sir Franklin. Sir Martin left the boy in his former master’s care. Sir Franklin was a harsh and often times cruel task master, making his several young apprentices work grueling hours doing seemingly mundane tasks, like chopping wood or clearing brush. The children were nearly as bad as their master, fighting for the coveted spot of favored pupil. Oliver spent several years with Sir Franklin, or The Harsh Master as Oliver had come to think of him. These tasks were interspersed with lessons of a variety of subjects for reading and writing to field stripping firearms. Oliver spent eight grueling years with his teacher before he had been deemed worthy enough, or forged in the crucible as Sir Franklin liked to say, to make the trek to a monastery of the Cyber-Knight order. It was here that Oliver received his cyber armor and demonstrated his ability to summon the psi-blade. Oliver spent a year in the monastery, learning with other Cyber-Knights. One evening after a series of strenuous tests, Oliver retired to the dormitory. It was on this night that Oliver had a dream vision. In his dream Oliver saw two knights walking a path when they come to a fork in the road, one leads to the city beyond while the other goes around it. The two quarrel over which path to take, at first trying to reason with one another. One of two Cyber-Knights offers a challenge, the winner getting to choose the path they’ll take. The two Cyber-Knights battle for what seems like hours, psi-swords clashing against each other. The knight who wanted to travel the path bypassing the city calmly blocks and attacks very little, while the other knight becomes enraged and savage. Eventually the second knight slays the first knight and travels to the city to continue his path of bloodshed. This dream frightens Oliver and he tells it to the master of the monastery, but little comes of the dream vision at that time. Valley of a thousand bandits. Now fully a Cyber-Knight, Oliver is invited on his first crusade. An experienced knight named Lady Bridgette and her followers are planning a crusade against a large band of marauders and bandits, known for tormenting and killing innocent folk. Oliver quickly and enthusiastically joins the crusade, heading into the Pecos Empire to fight the bandits in their home. Several months of hard campaigning came to a head in a small valley, where the remaining bandits battled the few surviving members of the crusade. By the end of the fighting only Oliver remained alive, triumphant Oliver still felt as if he had lost. Oliver buried the remains of the battle, which took him several days, before heading north to find other knight to tell the story of the battle to. While in the Colorado Baronies, Oliver heard the news that the brewing conflict between Tolkeen and the Coalition States had finally come to a head with the Coalition embarking on full scale war. Oliver headed north to join the fight against the Coalition, meeting up with several high ranking members of the Cyber-Knights along the way. Tolkeen greeted Oliver with open arms and put him to work battling their enemies. Oliver felt at home, when word came that Lord Coake didn’t want the Cyber-Knights fighting in this war, he promptly ignored it knowing he was needed there. Oliver fought valiantly and gained great prestige amongst his team and fellow soldiers. The Sorcerers Revenge was the killing blow that never came. Oliver was shocked to see what level Tolkeen would drop to, just to win their war with the Coalition, enlisting demons and monsters to fight the enemy. Fellow soldiers committing what could only be called crimes against the universe. Oliver’s mind nearly snapped. He deserted the field of battle and headed south. Oliver discarded his shiny knight’s armor, and with each step away from the conflict he discarded another piece of his old life until there was nothing but a tired looking man. Oliver traveled the wasteland deserts, at first avoiding conflict, but eventually fighting for those in need. He hid his true nature, denying what he had done or where he had been. Oliver became a figure for justice, but stayed to the realms of obscurity. Very few would recognize the young knight who had entered the war on Tolkeen, the last few years have aged the man considerably. It is for certain to all that he is a haunted individual. Last edited by Drake on Sun Sep 29, 2013 8:53 pm, edited 1 time in total.